We’re committed to making performances accessible to everyone and are able to offer wheelchair spaces to purchase online. Find your chosen event from What’s On and select ‘Book Tickets’. Choose one of the green wheelchair spaces from the seating plan, add to your basket and then complete the payment process. You only need to select one space and you will be given a wheelchair space plus a ticket for a personal assistant. If you do not need a ticket for a personal assistant please get in touch with your order number after you complete your booking. Alternatively you can select “Best Available Seats” and follow the instructions laid out below. Find your chosen production from What’s On and select ‘Book Tickets’. 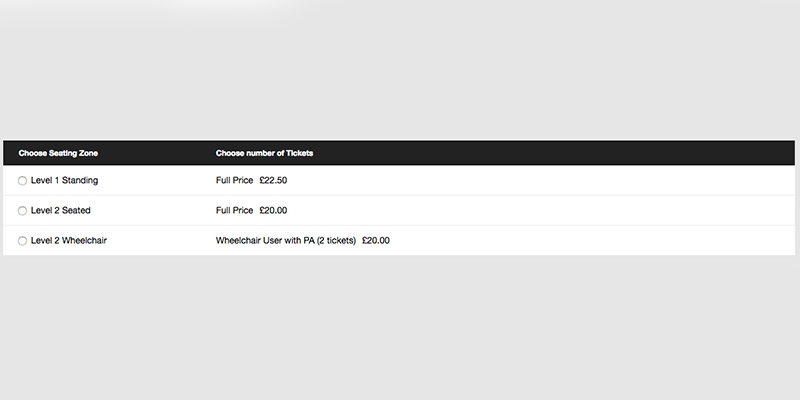 Select the number of wheelchair spaces from the drop-down, add to your basket and complete the payment process. You only need to select one space and you will be allocated a wheelchair space plus a ticket for a personal assistant. If you’re attending an event without seating then please make yourself known to our Duty Managers who will arrange priority entry and advise where best to watch the event. Our building is accessible for wheelchair users and we’re proud to hold a Gold Standard Award from Attitude is Everything. This recognises our firm commitment to providing the best possible experience for disabled visitors. We’ve lowered our counters at the box office, cloakroom and the reception of the Paul Hamlyn Roundhouse Studios. Our main space is very flexible and the position of wheelchair spaces changes, depending on the demands of the event taking place. We also offer a number of wheelchair spaces within the seated areas at performances. In standing areas for gigs or for all-standing shows there is no raised viewing platform for wheelchair users. However, for these performances, please make yourself known to our Duty Manager prior to doors opening. They’ll make sure you have priority entry and will be able to tell you where it is best to watch the event. In our Studio Theatre we have a number of wheelchair spaces that are reserved until the performance sells out, at which point they will be put on general sale. For promenade performances wheelchair users are free to roam standing areas. We just as that you make yourself known to the Duty Manager before the doors open, and they will arrange priority entry and will advise where it’s best to watch the event. Although our bars do not have dropped counters for service to wheelchair users, our bar staff will come out from the bar to take your order. We have accessible toilet facilities on all floors. As well as our wheelchair spaces we also have two wheelchairs for those with limited-mobility, which can be booked for use during your visit. You just need to arrange this beforehand with the box office. All wheelchair spaces can be booked in-person, over the phone on 0300 6789 222 or you can get in touch. We’re proud to hold a Gold Standard Award from Attitude is Everything. We were awarded this accolade because of our high standard of venue accessibility for deaf visitors. Our box office desk is equipped with a hearing loop system for those using hearing aids. Also, the Main Space and the Studio Theatre are equipped with a Sennheiser Hearing Enhancement System. If you would like to make use of this service, please ask at the box office and they will be able to lend you a compatible headset, to enhance the sound or to link to your hearing aid/cochlear implants. Details of captioned or signed performances will be listed under the dates and times tab on individual production pages. If you have any questions whatsoever, please don’t hesitate to get in touch. We’re proud to hold a Gold Standard Award, given to us by Attitude is Everything. We were awarded this accolade because of our high standard of venue accessibility and facilities. If you have a form of vision impairment our staff will be happy to help you if you need them, and our foyer signage is tactile and in braille. Should you require braille or large print material please let us know in advance by emailing access@roundhouse.org.uk. Assistance animals are very welcome in all areas of our building and although we’d recommend keeping them with you, if you’d like us to look after them whilst you enjoy a performance, again this can be arranged by emailing us at access@roundhouse.org.uk. Details of audio-described performances will be listed under the dates and times tab on individual production pages. We have a limited number of parking spaces for Blue Badge holders (for customers with a disability). Our parking spaces are offered on a first come first served basis, so please get in touch online to reserve your space. Our main entrance has level access through power-assisted doors from Chalk Farm Road. The car park offers ramped access to Level 1 (for car park users only) via our stage door. We have lifts providing access to all floors of our venue. 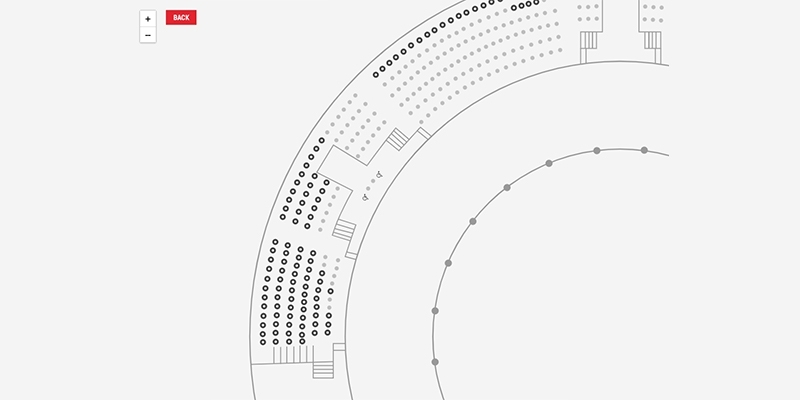 Our main space has level access to both levels 1 and 2 (Circle). For our Studio Theatre access is gently ramped. The Paul Hamlyn Roundhouse Studios are level throughout, with a power-assisted internal door adjacent to our reception. Please be aware that due to the nature of our Grade 2* listed building there are a number of narrow corridors in the studios area. The Roundhouse Bar & Café, Circle Bar, Members’ Bar and Torquil’s Bar all have level access throughout and there is level access to the majority of the terrace. We also have an accessible baby changing facility next to the Sackler Space on level 0. We always aim to be welcoming and accessible to all of our brilliant customers. As part of our commitment to this, we are able to offer relaxed performances for certain productions. Relaxed performances are aimed at encouraging and welcoming audiences who could benefit from a calmer environment, including those with a condition on the autistic spectrum, people with learning difficulties or sensory or communication needs. This will enable them to enjoy and experience live performance in a way that feels comfortable. Through creating a supportive and less formal atmosphere, we hope to create an experience that removes and reduces obstacles for people attending, who might feel anxious about new and unfamiliar surroundings. Provide a link to a tour of the building and a visual story, so audiences can familiarise themselves with building and space. Open the doors earlier than usual to allow those audience members the opportunity to arrive early, familiarise and settle in before the performance. Allow food and drink into the space (though strictly no glass in performance spaces). Arrange an opportunity for audiences to meet the characters from the production, who will explain the story and introduce themselves before the performance begins. Adjust aspects of the production’s light, sound and participation as required. Provide a chill-out space if any member of the audience feels they need to leave the performance area. Relaxed performances will be listed under the dates and times tab on event pages and tickets can be booked online. Alternatively if you have any questions then please don’t hesitate to get in touch or give us a call on 0300 6789 222. Is there strobe lighting at the Roundhouse? Many of our events are managed by external promoters and so it can be difficult for us to have the full details until very close to the day of the show. Most main space events will contain flashing lights, however strobe effects are rare. We’ll always advertise on the main space doors if strobe lights are in use. If you are sensitive to strobe effects then please contact our Visitor Services team – email us at a“ccess@roundhouse.org.uk(Access Email)”:mailto:access@roundhouse.org.uk or call us on 0300 6789 222 and we will find out the information you need from the appropriate source. Can I bring in medicines, food and drink to manage a medical condition, or medical equipment? For lots of our events we have strict entry policies in place for audience members. If you’d prefer not to be questioned by the security team, we recommend letting us know you will be bringing the required food/drink/medicine/equipment. We also think it would be good if you arrive at the box office on the night, where our staff will be able to assist you. You can contact our onsite Visitor Services team for more information by emailing us at access@roundhouse.org.uk or calling us on 0300 6789 222.